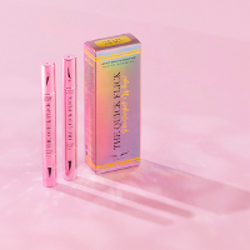 The Quick Flick wing stamps come in 3 sizes – petite for smaller wings, modest for standard wings, and grand for wings that pop, so whether you are after a subtle day look, or a WOW night eye, you can find the wing size you need. The Classic pens, which create a more rounded wing shape, come in multiple shades – Black for a classic eye, Hot Fudge, a medium brown for a softer eye, and Blue Velvet and Green Envy, to match your eye colours. The newly released limited edition To The Point creates sharp pointed black wings in no time. To answer a few FAQ’s – the eyeliner and wing stay in place all day, and are easily removed with makeup remover. The Stamp & Pen last for around 100 stamps, or 3 months (depending how often you use them). 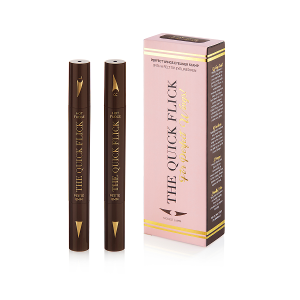 The Quick Flick Classic or To The Point Pen Duo Set RRP $34.99. If you want to see how they look on a 50+ eye, head over to our Instagram page – click the link at the bottom of this page.